Bringing spring; a brand new start! “The Vow of Ikeda Kayo-kai” was launched during the 27th Headquarters leaders meeting on March 4, 2009. The lyrics poetically expresses the vow to develop oneself based on the spirit of the oneness of mentor and disciple and the beautiful melody expresses the joy of fulfilling one’s mission. In October 1952, the YWD successor group “Kayo-kai” was formed. Second President Josei Toda wished the YWD members to “be as beautiful as flowers (‘ka’) and as proud as the sun (‘yo’)”, thus naming the group “Kayo-kai”. In March 2008, on the occasion commemorating the 50th Anniversary of 3.16, the “Ikeda Kayo-kai of the Second Act of Kosen-rufu” was formed. It rallied in all of the YWD members who pledged to strive alongside with their mentor for kosen-rufu throughout their lives. Subsequently in March, a commemorative gathering was held in conjunction with the Nationwide Youth Leaders Satellite Meeting at the various centres. Each YWD member whom attended, engraved themselves with the resolution to achieve “victory in expansion” and the “pledge for kosen-rufu”. “The bright Young Women Division members are working energetically for peace, their efforts heralding the arrival of a new age in our Soka movement. Brimming with joy, a solid network of young women – united with their mentor and committed to pioneering the second act of kosen-rufu – has now been firmly established. They form the Ikeda Kayo-kai. 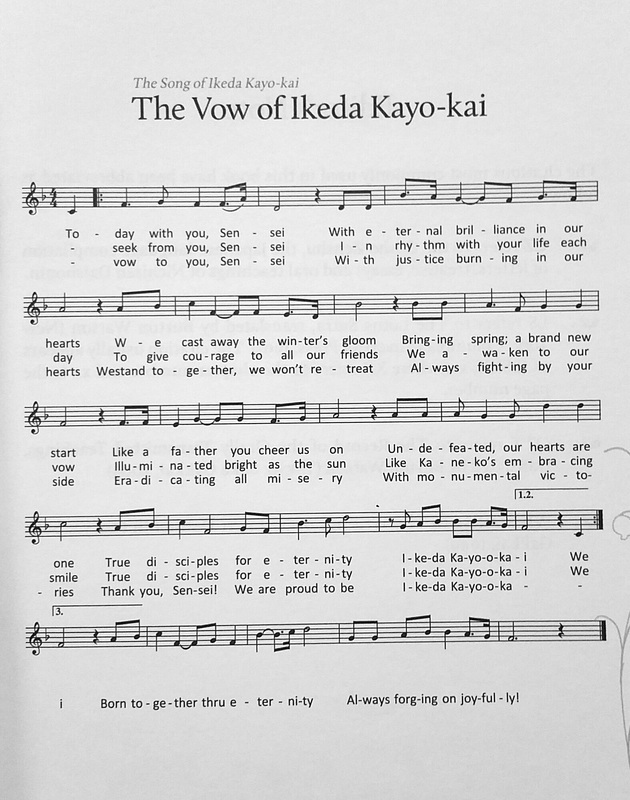 The song “The Vow of Ikeda Kayo-kai” was conceptualized a year later. The CD containing the draft copy of the song was presented to President Ikeda for amendment on 18 February 2009. “On February 18 this year, I first heard the original draft for the young women’s new song, “Vow of the Ikeda Kayo‐kai”. which is now being sung throughout Japan and also [in translation] in other parts of the world. I thought it was a fine song and that its writing team had done a commendable job. But I knew that they could do even better—that, with the challenging spirit of the Kayo‐kai, they could easily go beyond what they had achieved so far and produce not just a good song but a great one that would live on for generations. This is because I truly believe in the potential of these young leaders I had fostered. I shared these thoughts at the women’s division and young women’s division executive conference that was held that day. United in purpose, the Kayo‐kai songwriting team eagerly set themselves to the challenge once more. Fueled by daimoku and passionate life‐force, they infused the lyrics with a deeper vow, an even more profound commitment. I heard the new version of the Kayo‐kai song two days later. It had been completely rewritten and brimmed with vibrant joy. The vow of the Kayo­kai, a vow of gratitude. Upholding “The Vow of the Disciple” becomes the pride of the Ikeda Kayo-kai. This spirit will be transmitted eternally, responding to the mentor. May the Ikeda Kayo-kai members sing this song in high spirits, proudly declaring themselves as “Ikeda kayo-kai”, as you expand the network of happiness to the world. The Japanese version of this song was sung for the first time at the 27th Soka Gakkai headquarters leaders meeting held in Tokyo on March 4, 2009. Immediately after the meeting, Soka Gakkai Vice President Hiromasa Ikeda asked the SGI-USA YWD together with the Soka Gakkai YWD leaders to create an English version of the song to be sung all around the world. Rather than using the direct English translation, the SGI-USA YWDs chanted daimoku to write lyrics that expressed the same heart and vow as the original song, with unlimited appreciation for Ikeda Sensei and Mrs Ikeda, and the determination to always live as eternal disciples of Ikeda Sensei. The song was introduced on the front page of the May 2, 2009 Seikyo Shimbun. 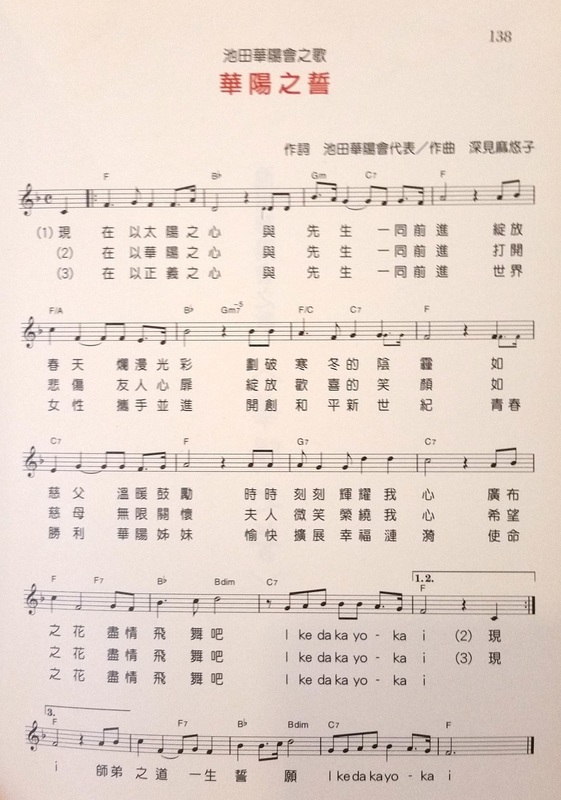 The Chinese version of “The Vow of Ikeda Kayo-kai” song was composed by the Taiwan-SGI YWD. It was launched on May 23, 2009 at their Nationwide YWD Regional Leaders meeting as they ushered in the establishment of the new Headquarters building on May 3.